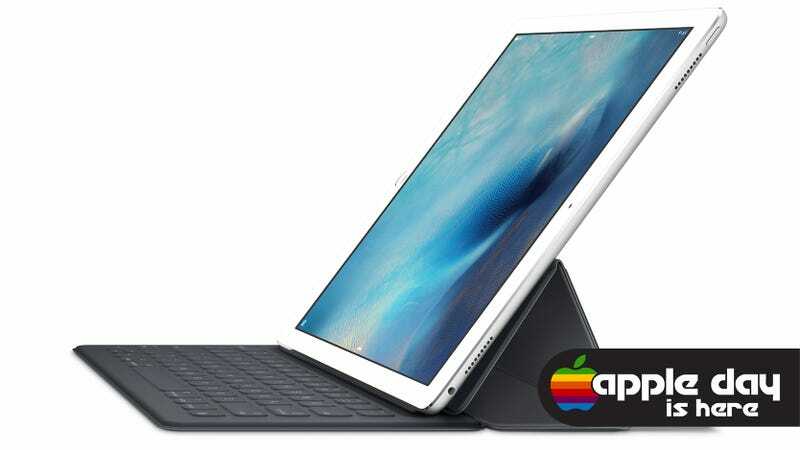 We knew that the iPad Pro was on the way to help Apple contend with super tablets like the Microsoft Surface. We just didn’t know exactly how far the Cupertino company would go to make it’s big new tablet look more like a laptop. Apple went pretty far. The new iPad Pro works with a new physical keyboard. It’s called the Smart Keyboard (of course) and it features the same new dome switch that’s in the keyboard on the latest MacBook. The fabric keyboard also serves as a cover for the iPad Pro as well as a stand to complete the whole wannabe laptop experience. It also connects to the iPad Pro with three magnetic sensors that also provide a port for data and power. That means no Bluetooth and no extra batteries. Obviously, keyboard like this have been available from other companies for ages. It’s also worth noting that Apple released a keyboard/dock accessory with the first iPad. But now a whole new generation will surely be created to work with the iPad Pro. Apple’s own physical keyboard looks pretty nice, regardless.